Aluminum Full View Doors When your business has a specific architectural look and design or even requires durable entry ways that allow a full visibility from the inside and out, the Full View Commercial Garage Doors with Overhead Garage door are the perfect choice in North Texas. Overhead Garage Door, LLC is your source for North Texas commercial overhead door products; we supply, install and service aluminum full view commercial doors from Clopay and C.H.I., which are two of the most reputable garage door companies in the nation. 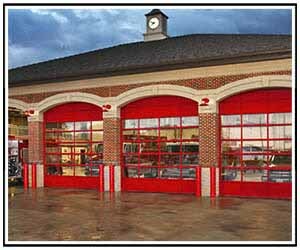 From restaurants to fire stations to retails stores, auto shops and car dealerships, the full view commercial doors are a suitable fit for all types of businesses and commercial establishments. Whether you need one door to replace a damaged or worn out overhead door or multiple doors for your new or remodeled commercial building, Overhead Garage Door, LLC can provide your business with the highest quality in full view doors from either C.H.I. or Clopay, which can be customized in many ways to match your company’s image and industrial design. The commercial full view overhead doors manufactured by Clopay are the perfect for architectural applications when your business needs visibility, to allow light in and want a modern, industrial design. Their full-view aluminum door series can be used in place of a traditional exterior garage door, as a partition inside your business or an oversized patio door that allows you to easily merge an indoor space with the outdoor patio. Clopay offers two full view door models. The 902 and 903 models, both have 2 inch thick sections, a maximum width of 24’ 2” and a max height of 20’ 0”; the panel spacing on the 902 model is 44” on center and the end panels vary, and the 903 model panel has equal panel spacing. Clopay Full View Doors come with multiple options for custom commercial overhead door needs for any business as well as building requirements. The full view aluminum doors from C.H.I. draw a significant presence, even with their simple design. The clean lines and sleek glass door panels achieve the unified look that makes any commercial building stand out. C.H.I. offer many options and accessories to satisfy custom commercial full view door needs specific to industry and business use. 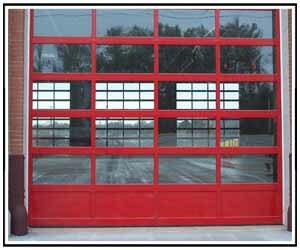 For more information about North Texas commercial garage doors, contact us directly.